The Alwar lynching case, in which five men were assaulted leading to the death of a Muslim man by a group of cow vigilantes, stalled both Houses of the Parliament on Thursday. 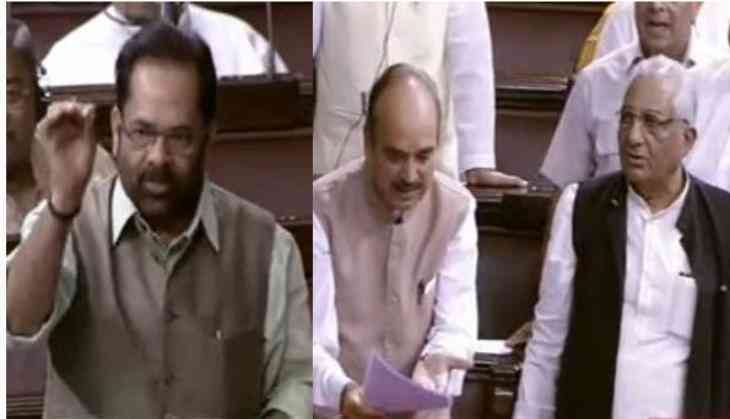 As a united opposition in the Rajya Sabha slammed the government for doing nothing against cow vigilante groups beating up people in order to protect cows from smuggling, Minister of State for Parliamentary Affairs Mukhtar Abbas Naqvi denied the occurrence of any such incident and said that it did not happen. "This is a sensitive issue. A message should not go that we are supporting cow slaughter! Such an incident did not happen on the ground. The state governmnet has denied the report. But let this House not send a message that it supports cow slaughter," Naqvi said. Reacting to this, Leader of Opposition, Ghulam Nabi Azad said that even the New York Times had carried a report on the lynching. "I am extremely sorry that the minister is so ill-informed. Even the New York Times knows and the minister doesn't know," Azad said. Senior Congress leader Mallikarjun Kharge raised the matter in the Lok Sabha and said that the Rajasthan Government failed to act on the issue, adding that this was the fifth such incident in Rajasthan. Kharge also demanded an immediate reaction from Home Minister Rajnath Singh. Congress MP Madhusudan Mistry said that there is a breakdown of constitutional machinery in Rajasthan. After the members from both the sides raised their voices, Deputy Chairperson P.J. Kurien asked the government for the facts in the case. Terming the matter serious in nature, Kurien said he was not convinced by both sides and asked Naqvi to ask Home Minister Rajnath Singh to submit a report to the House. "I cannot go by media reports," Kurien said. To which, Rajnath Singh told the Lower House that the state government is taking cognizance of the matter. Meanwhile, Congress Vice President Rahul Gandhi expressed his anguish and called the lynching a failure of law and order in Rajasthan. "When government abdicates responsibility and allows lynch mobs to rule, tragedies of immense proportion follow. Shocking breakdown of law and order in Alwar. All right thinking Indians must condemn this blind brutality. We expect the governmnet to take strict action against those responsible for this brutal and senseless attack," he added.